Super Bowl weekend is one of the most bittersweet times of the year. As viewers across the country tune in to watch the two best teams at the highest level of the sport suit up, reality soon sets in that the roughest stretch of the calendar year is upon them. There is merely one game separating fans from a seven-month stretch without football. But don’t worry. There’s no shortage of storylines to occupy Oregon Ducks fans this offseason. Here are some events and developments to entertain green-and-yellow, football-starved enthusiasts until the sport resumes in the fall. Kristian Williams would be a big-time addition for the Ducks. 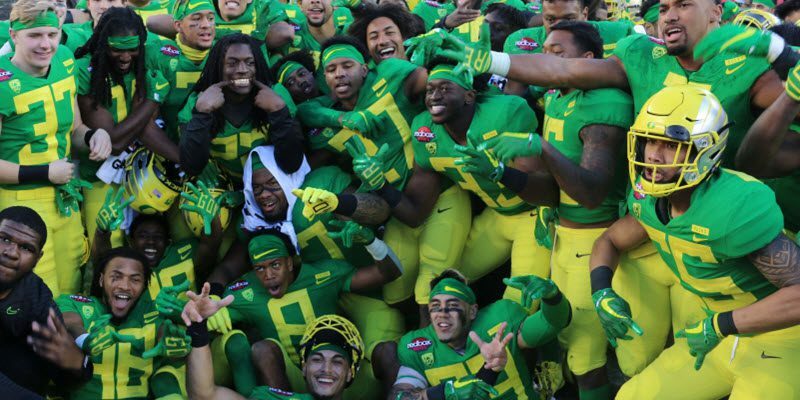 The Ducks, like most programs these days, signed the majority of their 2019 recruiting class in the early signing period. They signed 22 prospects in December, including their highest ranked signee of all time, Kayvon Thibodeaux. But there are still coveted players that remain unsigned heading into Wednesday’s official signing period, and the Ducks certainly aren’t done adding players to their historic class. They have already earned commitments from three additional players, and they’re in the running to land a handful of others. 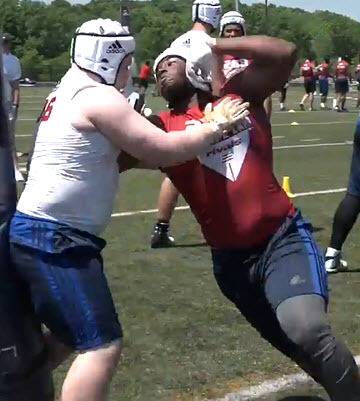 One of the most promising prospects that the Ducks are looking to land is defensive tackle Kristian Williams. The Tennessee product is a fringe four-star recruit, depending on the outlet, and the Ducks are certainly on his radar, as he recently visited the school. It will be interesting to see whether they are able to land him and any other prospects before Signing Day rolls around. Receivers like Tabari Hines struggled to improve under Johnson. Coaching turnover is part of the game, and the Ducks are no strangers to dealing with it. This year, their staff remained relatively intact, but they did lose a few position coaches. Of those, they still have to replace wide receivers coach Michael Johnson, who left for the same job at Mississippi State. Johnson was an excellent recruiter, largely responsible for the elite quartet of receivers the Ducks signed in December. So, his presence will be missed on that front. But as successful as he was at recruiting, many were disappointed with the development of the receivers on the roster under him. Dillon Mitchell was an obvious outlier, but the rest of the receivers never found a rhythm in 2018. Their struggles were one of the reasons that the Ducks’ offense regressed. Whether Mario Cristobal can find someone who can both maintain Johnson’s recruiting momentum and develop his receivers will be a big storyline this offseason. Johnson makes a terrific, one-handed catch. The transfer portal has taken the country by storm. High-profile players across the board are entering their names in the system to see if they can find greener pastures. The Ducks have one of their own players, quarterback Braxton Burmeister, in the portal, and it’s expected he’ll play somewhere else in 2019. But they may also be the beneficiary of a couple of transfers themselves. 247sports reported that Penn State wide receiver Juwan Johnson has a visit scheduled with the Ducks. The 6’4” 225-lb. receiver would be a massive acquisition at a significant position of need. The Ducks need more playmakers with size and athleticism out wide. Johnson fits the description to a tee, and has already proven that he can produce at a high level. Furthermore, it’s been reported that Cristobal was one of the primary recruiters who pursued him in his initial recruitment, so the Ducks appear to be in a good spot here. The other big name on the market is former number-one overall recruit Jaelan Phillips. Although he’s widely expected to transfer to Miami, BleacherReport hinted at the possibility of him joining the Ducks. This is nothing more than pure speculation, but the thought of Phillips and Ducks’ early enrollee Thibodeaux rushing the quarterback together is tantalizing. The date of the spring game is one that fans always circle on their calendars. It’s the closest thing to actual football that they’ll witness for the next seven months. This year’s scrimmage is particularly intriguing. 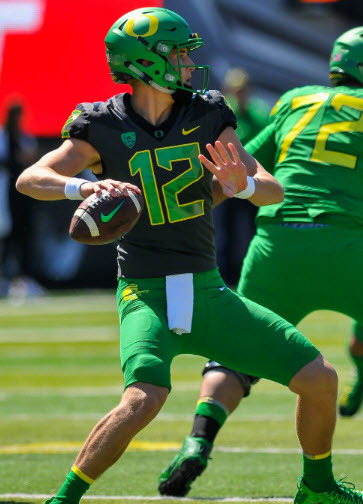 There has been plenty of chatter about the struggles of the offense, and many are hoping to see the Ducks significantly alter their scheme in order to maximize their talent. 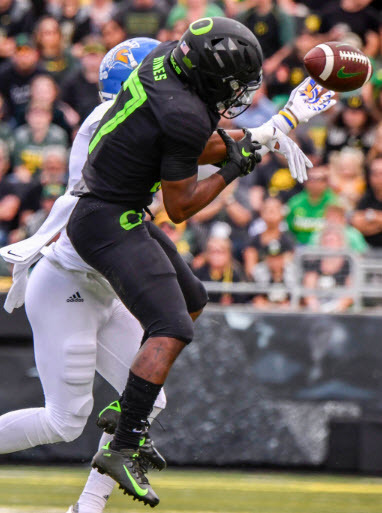 Although coaches rarely reveal too much during spring games, there’s a good shot that we’ll catch a glimpse of a modified offensive approach when the Ducks take the field in the spring. Not only will the showing give us an idea of what to expect in the fall, but it will open the door for much discussion to satisfy our football itch over the long offseason. Shough may be Herbert’s successor. There are plenty of position battles to keep an eye on. Assuming Burmeister is out of the picture, Tyler Shough (pronounced “Shuck,” by the way) and incoming freshman Cale Millen will battle for the all-important backup quarterback spot. The winner is expected to be Justin Herbert’s successor, so all eyes will be on these two to see who will be leading the Ducks in 2020. The wide receiver rotation is logjammed with unproven players, all talented enough to make it hard to choose between them. The Ducks signed four high-ranking players at the position in the early signing period, and it would be a shock if a couple of them didn’t see action early on. Then, there’s the potential acquisition of Johnson, who will assuredly be in the running for a starting job if he joins the squad. And finally, there are the current receivers on the roster, who have flashed potential, but have not been consistent. On the defensive side of the ball, the Ducks will be looking for pass rushers to replace graduated stars Jalen Jelks and Justin Hollins. While Thibodeaux will be the name everyone keeps an eye on, there are other guys on the roster who could also earn a starting job, like Keith Simms, Drayton Carlberg, Lamar Winston Jr. and Adrian Jackson. And finally, Troy Dye’s return eliminates the competition for one of the inside linebacker positions, but the other, which rotated starters throughout 2018, is still undecided. It could go to a veteran like Simms or Sampson Niu, or a newcomer like Mase Funa or Ge’mon Eaford. This year’s offseason stretch will be especially agonizing, considering the Ducks have a big-time opening matchup against Auburn waiting for them at the end of the tunnel. But hopefully, these various storylines will provide enough diversion to make the offseason bearable.